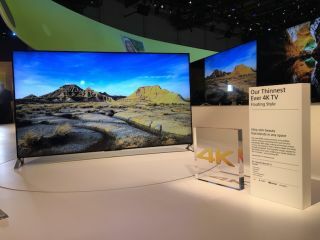 CES 2015: Sony X90C TVs are world's thinnest 4K Ultra HD sets | What Hi-Fi? Sony's new X90C televisions are available in 65 and 55in screen sizes and – thanks to their special edge coating technology – they're only 0.2in thick, which makes them the world's thinnest 4K Ultra HD sets. Pricing isn't yet available unfortunately, but the UK model numbers for these ultra-thin sets will be KD-65X9005C and KD-55X9005C for the 65 and 55in screens respectively. Like all of Sony's 2015 TVs, the X90C series will use the Android TV platform. Due to the slimness of the set, the X90C uses standard downward-firing speakers as opposed to the magnetic fluid design you see on some of Sony's other 4K models. There's also a revised version of Sony's One-Flick control system, originally introduced in 2014.